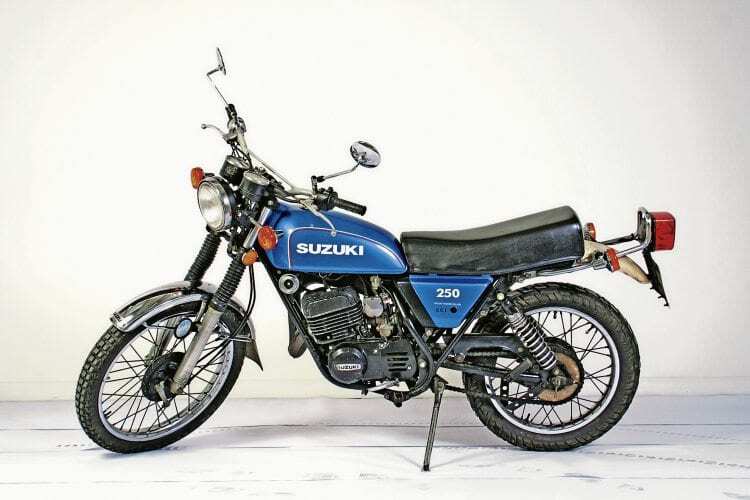 As early as 1964, Suzuki had an eye on the lucrative American off-road bike market. Taking one of its commuter bikes based on the successful K series singles, the company produced the surprisingly competent K15 Hill-Billy, aka the Trail 80. This bike remained on the books for two years, then disappeared before re-emerging in a new guise in 1968 as the KT120, which was fitted with a three-speed box augmented by a high/low transfer box. During those intervening years, Suzuki had done little to progress the concept of true off-road machines, although it had slavishly followed the trend for street scramblers. Chrome guards, a well-padded seat, a black-finished single-cylinder two-stroke engine and good all-round performance made the Suzuki an attractive, if heavy, proposition. Unlike its competitors, Suzuki even went so far as to advertise the fact that its various TC200 Stingrays, TC250 X6 Scramblers and TC305 Laredos had some genuine off-road potential. Sales of handlebars, levers and tanks for all three soon confirmed that emphatically they were not dirt bikes! Come 1968, Suzuki was suitably stung into action when Yamaha unveiled its mould-breaking DT1 250 at the Tokyo Motor Show. Although they were relative newcomers to the motorcycle game, the boys from Iwata not only stole the show but also completely wrong-footed all of their competitors. Suzuki had always aspired to be at least the second-best-selling motorcycle brand stateside, so had to come up with a viable answer to the DT1 that was creaming in the sales. The answer was as obvious as it was potentially pernicious. Why re-invent the wheel when the answer was staring you in the face? The costs of researching and developing a new model had the potential to be financially crippling, but with Yamaha doing so well, why not crib the key details from your competitor? Being second to market may not necessarily win you the plaudits, but it certainly gets the money rolling in a lot more quickly.